A few years ago my husband and my late father-in-law were heading out to the west burbs to look at an old jeep and my father-in-law had seen Schmaltz Deli featured on television and suggested to my husband that they stop there for a sandwich. On the website, they call themselves the "only classic Jewish deli west of Chicago." They are located in Naperville. They have a large menu of sandwiches featuring corned beef, pastrami, turkey, brisket, beef, salami, fish and more. And there's even a monster sandwich: the Quadruple Decker - four layers of corned beef, pastrami, grilled salami steak, Schmacon, creamy slaw, Swiss cheese and Russian dressing on five slices of Jewish rye bread for $30. They also have Matzo Ball Soup, knishes, latkes and bagels (and a breakfast menu of breakfast sandwiches made with their bagels. Sandwiches come two ways - overstuffed and half-stuffed. The photo below is a half-stuffed. Hubby and I split it for lunch. It's the #20 Old New Yorker sandwich, with corned beef or pastrami on seeded Jewish rye with Russian dressing and Schmaltz's creamy cole slaw. 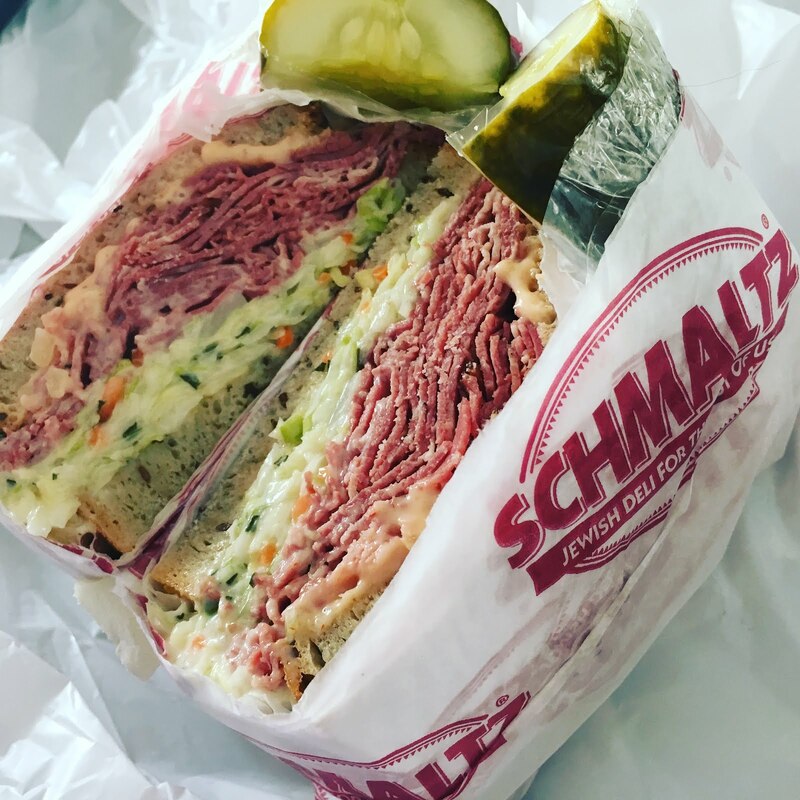 If you're in the Naperville area and have a hankering for a sandwich from a good, traditional, classic Jewish deli, make a detour to Schmaltz. You definitely won't be disappointed. For more info, visit Schmaltzdeli.com.